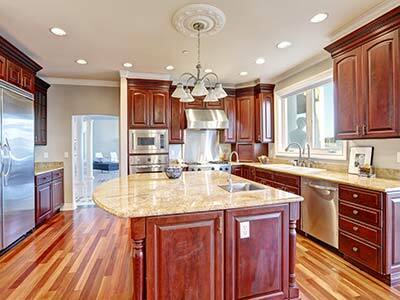 Kitchen cabinets are a vital component of any kitchen. They are required for storage and need to be planned well in order to accommodate all the necessary items in your kitchen. But great kitchen cabinet design is never a matter of chance and you need to hire skilled contractors like us to ensure the job is completed with attention to detail and you get stunning cabinets that add to the aesthetics and functionality of your kitchen and home. Aside from this, a well-designed and installed kitchen enhances the value of your home as well. We at Neal Ragan Construction are the experts that can handle all types of kitchen cabinet design and installation jobs. Over the years we have successfully completed a large number of projects for customers in and around Johnson City, Kingsport, and Bristol. Aside from this, we also have offices in Virginia, Abingdon, and Damascus. We have a specialist home design team that can handle every aspect of the kitchen cabinet planning expertly. Our experienced and skilled carpentry team works diligently to ensure that all the features are crafted with care and finished to perfection. With such vast experience behind us, we know what it takes to provide custom kitchen cabinet design and pay personal attention to every single client. Most often kitchen cabinets are made of solid wood or MDF. While the latter is more cost-effective solid wood has a better finish, is sturdy and durable too which provides value in the long term. We can design and build wall cabinets as well as base cabinets. The latter sit on the floor and support the cooking stations, sinks and countertops and their design defines the overall structure of your kitchen. These cabinets are typically used to store heavy and bulky utensils. The wall cabinets have a lesser depth and are positioned above countertops. These cabinets may have wooden, glass or laminate-covered shutters. These are used to store packaged food items, and crockery as well. We understand that every homeowner has certain requirements and preferences when it comes to kitchen cabinet plans and designs. It’s why our designers work closely with you to identify what your specific needs are and then provide solutions that work perfectly for your needs. We use only the best materials and workmanship in our projects and this ensures the aesthetics and durability of the features. The hardware used will be of best quality which means the drawers will run smoothly and the shutters will open and close without a glitch. We provide guarantees for our work which means we aim to do the job right the first time around. It is this attention to detail and focus on quality that has made us the preferred kitchen remodeling experts of many homeowners across the region. We can handle projects of any scale and complexity so call us with your requirement today at 276-608-9626. You can also contact Neal Ragan Construction via this online form and send us details about your project or queries about kitchen cabinet cost.